The elephant is the national symbol of Thailand; a gentle beast still used for transportation and labor in the rural areas up north. They are also a tourist attraction in the streets of Bangkok. In my first two months here I didn’t see any roaming the streets, despite seeing footage of the domesticated creatures on travel shows and in guide books. Then this week, I saw three. On a night out with friends in Silom we came across a baby elephant and its busker. It was sweet; leaning back on its hind legs and bowing, gobbling up sugarcane offered in the palms of our hands. It felt nothing like I had expected; its skin had hard wrinkles and creases and its head was covered with hairs that felt like thin steel. But it was the animal’s eyes that had a haunting and heartbreaking effect on me. Its pupils were dilated and it seemed as if it had been drugged. It is a debated issue as to whether or not they’re tranquilized. After all, an animal of that size and power is not meant to roam the fetid streets of Bangkok. It is a sad fact of life in this city; tourists are delighted and awed by these animals, paying money to feed them. The brief thrill for the visitor though perpetuates the cycle. Thankfully there are ways for travelers to have a close encounter with these beautiful animals without condoning a cruel practice. 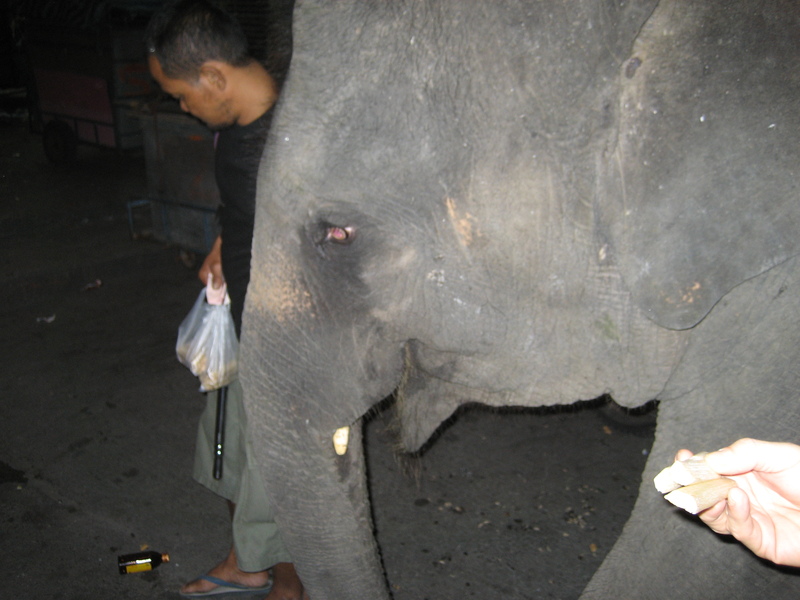 The Elephant Nature Park north of Chiang Mai that is a sanctuary and rescue center, and the Thai Elephant Conservation Center in Amphoe Hang Chat provides medical treatment for sick elephants. They are both open to the public, who can interact with these magnificent animals in a more natural environment. Looking back, it was a mistake to participate. But when a baby elephant is standing in front of you, it’s hard to resist giving it a pet. Next time though, I will go to one of the dedicated parks that protect the elephants. And I’ll bring some handy-wipes; elephant slobber on your hands is quite unpleasant. 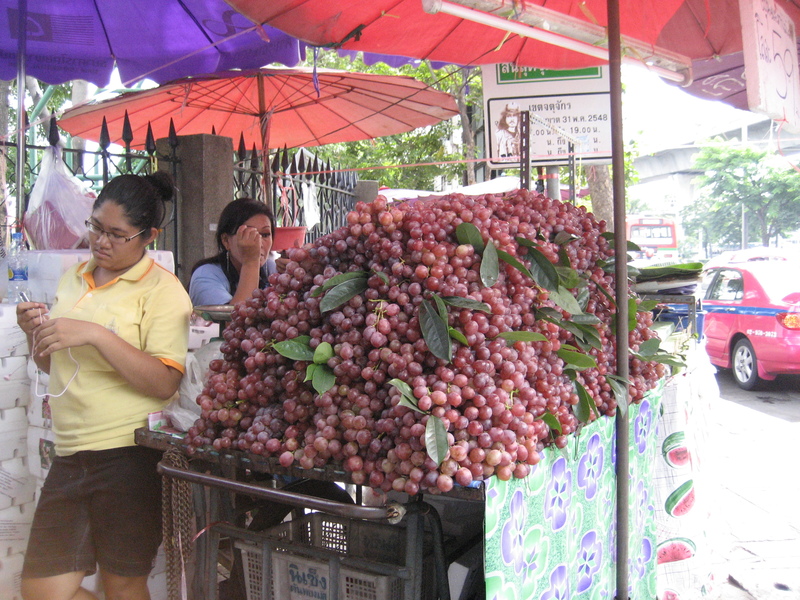 Funny thing about Thailand … Grapes! This is by far the most grapes I’ve ever seen in one location before. I was also impressed by the symmetry of this pile. Couldn’t help but think how fun it would be to dive in the stack and start eating my way from the inside out. Yum. Wikipedia says the red part is the rind and the white, mushy middle is the edible bit. The white fruit is quite delicious; it has a tangy, citrus taste and is very refreshing. So if you find yourself asking if you should eat the red part, the answer is a very distinct no. Unless you want the inside of your mouth to feel like you’ve licked pavement. Apparently, ignorance and forgetfulness will get your electricity cut off. After receiving a half slip of paper in my mailbox that was entirely in Thai and thus not decipherable, I stuck it in my bookcase and promptly forgot about it. A frantic call from my landlord saying my electricity would be cut off if I didn’t pay by 5 pm totally perplexed me. I insisted I hadn’t received a bill. He got more anxious. I remembered that little piece of paper. He started breathing again. Turns out, if you forget this sort of thing, you can take the elevator to the second floor in your pajamas and have your landlord messenger the money over for about two bucks. Have I mentioned how much I love Thailand? On another note, after being warned about the dangers of riding a motorcycle taxi and promptly dismissing them, I sustained my first injury. Thankfully it didn’t necessitate a helmet; I singed my leg on the muffler. Now what you’re about to see isn’t pretty. 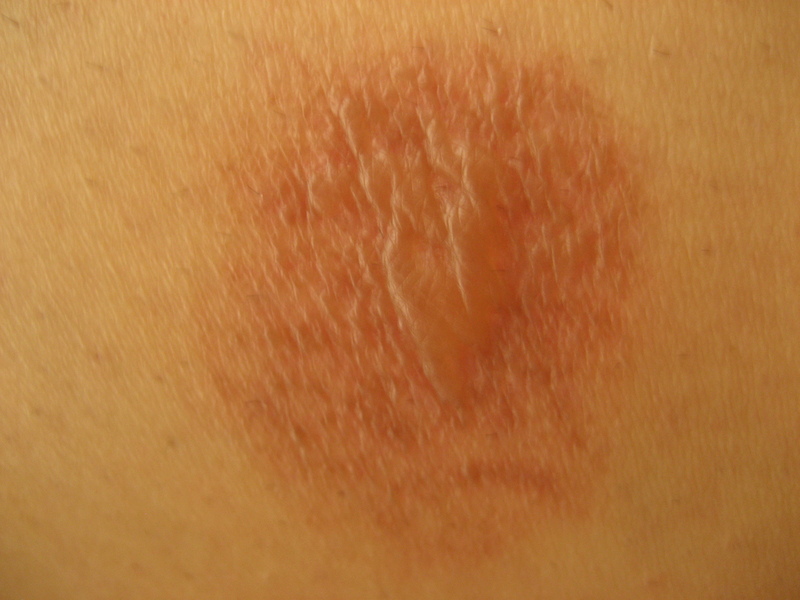 I can’t shave my legs where the burn is. Gross I know, but I wanted you to have the full experience. A tip: Don’t eat for about 30 minutes. The sports that figure prominently in Thailand are Muay Thai boxing, badminton and … football? Considering that this country doesn’t have professional football (or soccer for us Americans) teams to speak of, who do they follow? The English Premier League. Not only do they follow the clubs, they garner a fan following that is on par with England itself. Team jerseys are sold at every sporting outlet; hats, towels and various gear are sold at street stalls and mall kiosks; and they even offer a Man U credit card. But on this Saturday night, I witnessed an obsession with the Premiership that is as entertaining as it is puzzling. About 100 people were gathered on all five floors of the MBK Center shopping mall, one of the largest and most popular in Bangkok, to watch Liverpool take on rival Manchester United. Two jumbo screens were broadcasting the game on both ends and Thai fans, decked out in Man U and Liverpool gear, sat around the railings with friends and cheered on their respective teams. Close goals and Liverpool’s eventual win drew hoots and hollers that could be heard at every level and inside every store. This kind of rousing display makes me curious about what Thai football fans would be like at a Premiership game. Would they stick to their Buddhist instincts and cheer peacefully? Or adopt the behavior of English football hooligans, and start chucking beer and throwing an inebriated fit? Considering how cool and calm Thais are on a daily basis, I would totally pay to see the latter. We could bond. Most of the posts I have done thus far have described the unique and interesting things that I’ve noticed about Thailand. I’ve ridden on motorcycles, gone to the beach and eaten strange fruit. But there is an uncomfortable and difficult part of uprooting your life and moving to a foreign country … culture shock. As a first-time expat, I can tell you that the difficulties of moving to Thailand have been immense. Aside from the obvious hurt that comes with leaving behind your friends and family, there are the challenges you confront in everyday life. Not knowing the language and the inability to communicate with taxi drivers and store clerks probably top the list of the most frustrating aspects of each day. I have noticed that culture shock is very much like the 5 stages of grief. First there is denial. This affected me for the first few weeks; I failed to wrap my head around the fact that this was my new life and that I did, in fact, live in Thailand. The next stage is anger. This is where I’m at now. It is not something that I outwardly express, but when everything around you is so unfamiliar, you are bound to become frustrated. Thankfully it can really only go up from here. Bargaining is the next, followed by a little dip with depression and finally acceptance. From what I hear, that should hit at about the six-month mark. And I can’t wait for the day when I chill out, take a deep breath and finally accept that there will be traffic, I will sweat and I will get puzzled looks when I pantomime to the store clerk that I am looking for hangers. Music by Get Set Go.